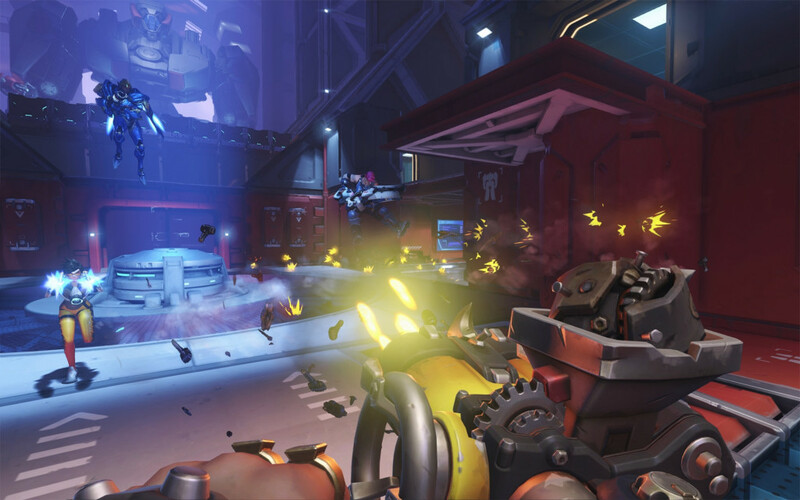 Even though 2K’s Battleborn beat Overwatch to the punch when it comes to release dates, it’s actually Blizzard’s competitive shooter that is getting the most ‘buzz’. While both shooters initially showed a lot of similarities, now that both games are actually available, it seems there are a lot of differences, some good, other slightly less popular. We know Blizzard stands for quality but seeing this genre isn’t really close to their usual getup, we were surprised at what the company has done with the game. Before diving into the fray, we were only arguing about one thing, namely which of the impressive looking cast of characters we’d play with first. Even though the game has a short intro clip and the initial trailers showed a lot of promise when it came to the overall story, there is simply no story to be found in the game itself. While there should be a lot of lore about the characters, there is simply zero story value in the game itself. A sad choice, but in the end an understandable one. Seeing the game cannot be played offline, a story would be rather bothersome to plow through when you’re playing with other gamers. Still, some story value or an offline, short, training mode which makes you play with all characters, while adding a plot, would have been nice. 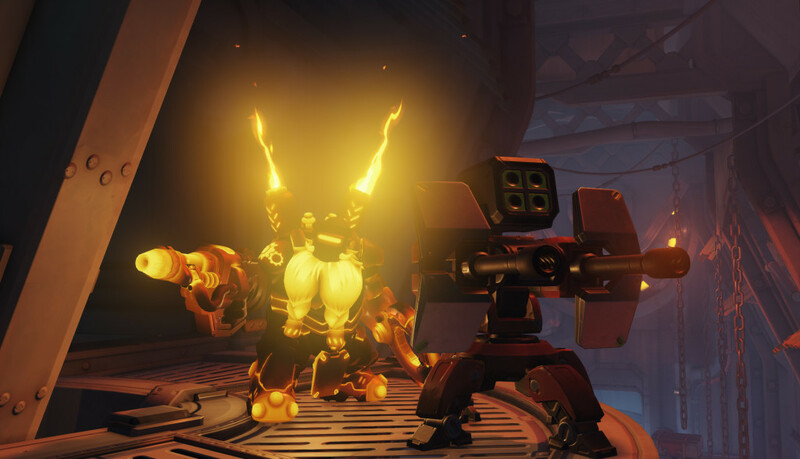 For some it might seem like the resemblances between Battleborn and Overwatch are rather clear, as both don a very vibrant and colorful style, with a certain sense of ‘realism’ that matches their respective universes. Nonetheless, Overwatch tends to look like a spiced up version of one of Blizzard’s other games, namely Heroes of the Storm. In many ways the game, even though it’s not really the same genre, feels like it’s the proper first person version of said MOBA title. With a cast of characters that is quite diverse, there is no character that truly stands out as different or incompatible with the rest. Of course, each character looks very original and has its own set of quirks, but it all comes together as a great looking whole. The same can be said about the maps, which are also done in the same, rather comical, style. While these maps often aren’t that massive or don’t have that many astonishing backdrops, they look good and set the tone perfectly. 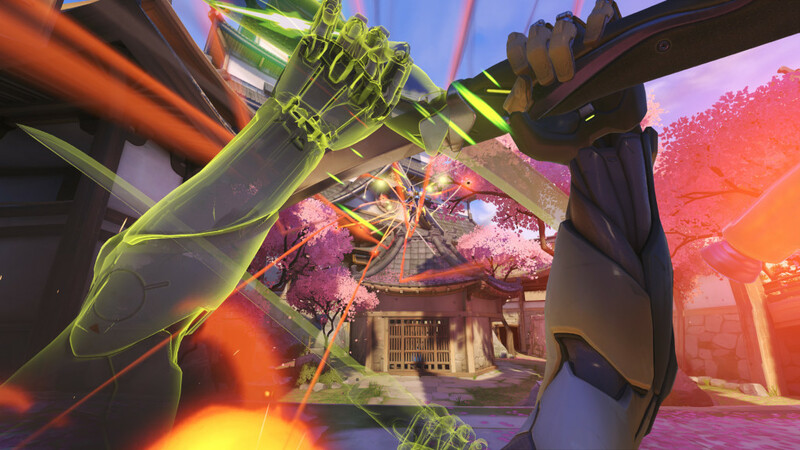 Even though the theatrical presence of the soundtrack swells up now and then, the music in Overwatch is rather timid, possibly due to the action all around you, or perhaps to make it easier to keep your wits about. Nonetheless, the music that is present is decent, but not that memorable, compared to many other games. The limited voice acting that is present in the game is superb and makes us sad there isn’t much more to enjoy. Certain characters have their one-liners in their native tongue, thus it’s not surprising to hear a bit of French and Japanese when being shot in the face. 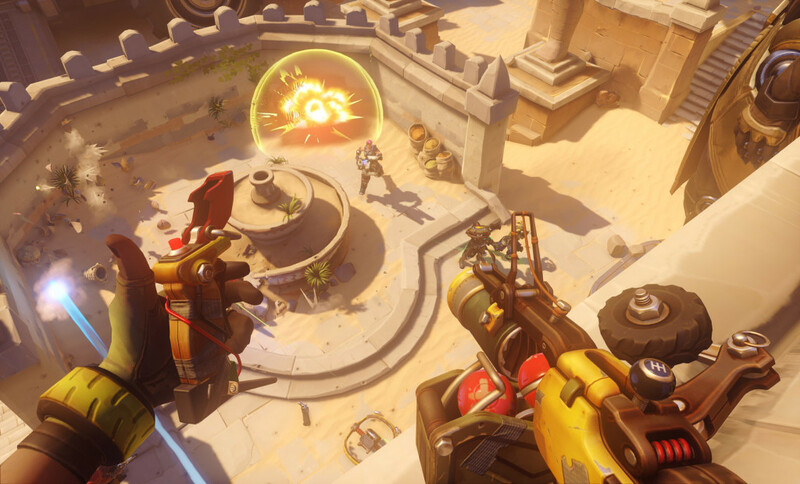 Overwatch is a team based competitive first-person shooter, which is actually a lot simpler than one would originally think. You’ll always fight in teams of six, and either have the objective to defend or attack. While there are small variations of said objectives, overall you’ll be doing the same thing over and over again, which in this case is absolutely not a bad thing, though some might disagree. Again we make a small comparison with 2K’s Battleborn, namely that Overwatch is actually a lot more accessible compared to Battleborn. While both games are really easy to learn, control and eventually master, it’s the duration of the matches in Overwatch that is the game’s trump card. You will be able to play for around ten minutes, and still complete a match, compared to Battleborn, where you’d have to make sure you’ve had enough time on your hands. That being said, Overwatch is online play only, thus no local co-op, which means you can’t take a friend online with you for some team based couch co-op fun. As mentioned before, the game is all about defending or attacking certain points. In some cases these points are static areas you’ll have to conquer, other times you’ll either have to prevent a vehicle from progressing, or help it progress. This simple concept may be a bit bland to some, but in many ways it works properly, mostly due to the varied cast of characters. You’ll notice that everyone in the team has his role, ranging from offensive, defensive to support characters. A tank can often take the damage, when a healer and swift attacker follow its footsteps, while teams that go full offense might run into a brick wall when their opponents have a well balanced and well oiled team composition. Sadly, while the modes stay fun, if you’re into the game and its characters, it will also scare off many potential buyers as it’s ‘all there is’. Granted, there are collectibles, but this all just about covers the goal and purpose of the game. Creating a successful shooter on consoles is always a bit tricky, especially when you have a rather big cast of characters to choose from, all with different control schemes. The controls feel a bit arcade-ish, like older tournament shooters such as Unreal Tournament, meaning they are very fluent. Aiming is no real issue either, except some of the trickier classes will prove to be a challenge. Nonetheless, it’s also fun to see that a console shooter offers its users the chance to change the key bindings, which allows everyone to go for the setup he or she desires. Even though the characters feel rather balanced, the console release suffers from another type of imbalance, namely players who are constantly leaving and spots that are getting filled up rather slowly. It’s not that easy to win a match when your team is down to four players, when the enemy team has a full six player team. Perhaps some penalties for leaving should be implemented, or that one can not join a new match as long as the old one is still in progress. The latter would immediately help a lot, even though some players might just go AFK during the match they were going to leave. As stated above, the game has a lot of collectibles but no actual goal or purpose, and it feels like these collectibles are just another ploy by Blizzard to rack in some cash, seeing they already offer ‘loot boxes’ for a hefty price, if you want to unlock some new skins and other useless gimmicks. 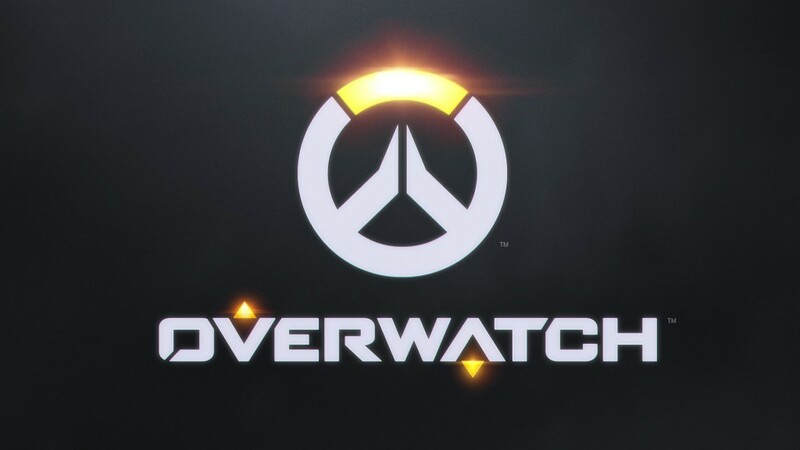 Of course, Overwatch still remains a great game, but there is no gear, no proper rewards when leveling up and as it stands now, many players might get bored rather quickly, simply because they didn’t know the game would have such low amount of content.